Tuesdays were my Mogwai days. When I was in town, I was there with friends. That particular Tuesday night, mountaineers Mimis and Ranger joined. So, knowing how much these two know about the mountains up north, I asked them for a site for TREK. Finding the TREK site is like finding a partner, you'll just know if that is the right one. From the two's initial description of the site they have in mind, I was filled with hope. There were just a few problems. They cannot remember the name of the site and the numbers they supplied were all not working. Mimis and Ranger could not guide us because they already had an expedition planned that weekend, on the same mountain range. 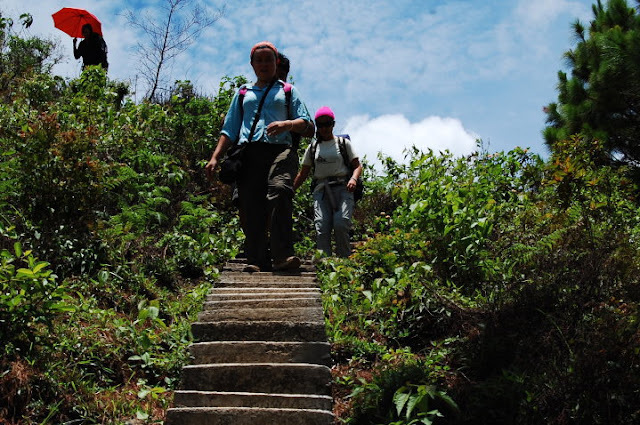 Only, they will take the really long route, and by long, I meant them entering from Nueva Vizcaya and exiting at Kibungan, Benguet, an estimated three days of walk, which turned out to be four. 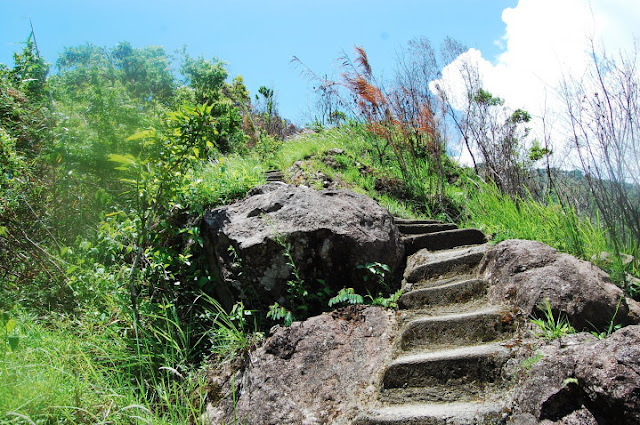 So, we were left with just the description of the site and how to get there, plus the comfort that one of our teammates, Ben Penada, has actually been to the jump-off point. We went on our usual way of contacting tourism officials hoping that they will point us to a guide who can lead us to that place that can be reached if we follow the trail on the left side of Kibungan, Benguet's municipal hall, that we will walk for four hours and we will traverse a long hanging bridge. We had a bigger recon team. Charo, a mountain guide and a current employee of the municipal hall, joined us. The first five minutes of our trek, we were passing by residences. Then, we negotiated carved on the mountain. It was difficult, but it had a magnificent view of the Cordillera mountain range. After two hours of descent, we reached the hanging bridge. From there, we took a short ascent, skirted the side of the opposite mountain until we reached another hanging bridge, a much shorter one. We passed by a total of four hanging bridges. At 2:00 PM it started to pour. We decided to regroup and rest in the next waiting shed. By this time, we have already covered more than 3/4 of the trail. We thought it was never ending. It felt like it. When the rains slowed a bit, I went ahead with Charo. I reached the community at 3:00 PM. I was almost winded. The rain freshened me a bit. The members of the community were gathered in a hut beside the school, where the teachers live. There was a thermos ready and I was offered a drink. Even before I was able to pour the liquid, the aroma and taste of coffee were already filling me. It was just hot water in the thermos. I scouted the table but there was no coffee. Nevertheless, the hot water warmed me enough. We had a few attempts to converse, but there was a language barrier, but I guess from the few words they could understand from me and from my wet clothes, they got part of my story. When the rest of the team arrived, we excused ourselves and went to one of the classrooms, where we would sleep that night. We brought out our stoves and cook sets, made some soups, started preparing our dinner and changed to dry clothes. We brought these chilies at the store near the municipal hall. The store owner warned us about these small and plump chilies that looked almost like bell peppers. My head felt like it exploded and my ears numbed when I took a bite of the chili or "sapuke". We had to remove portions of it that we added to our soup. To think that we were all confessed chili lovers. After settling in, we invited the Alternative Learning Systems teacher, Cleran Dayso for a discussion. After several attempts of pronouncing his name right, we just decided to call him Claire. We interviewed him about the kids’ needs. Going to Polis takes a lot of strength and willpower. But that is our mission, to help schools that because of their isolation no longer get the same aid and attention as their counterparts in other areas. Months after our recon, we went back to Polis for the outreach. 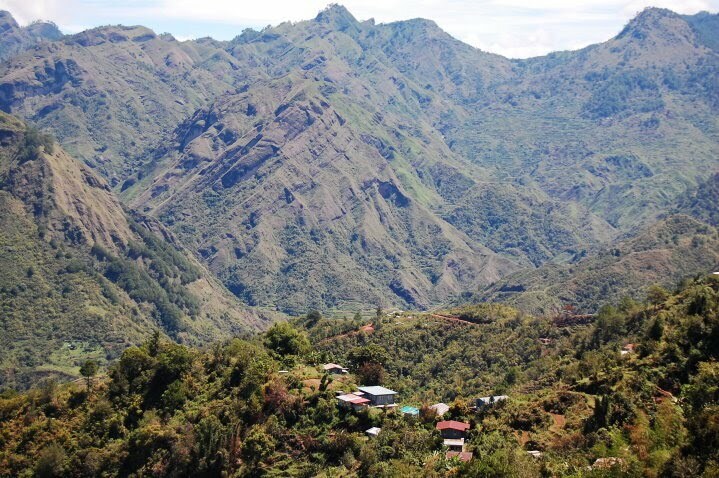 Sitio Polis is home to the third largest cultural community in the mountain provinces of Northern Luzon, the Kankanais. 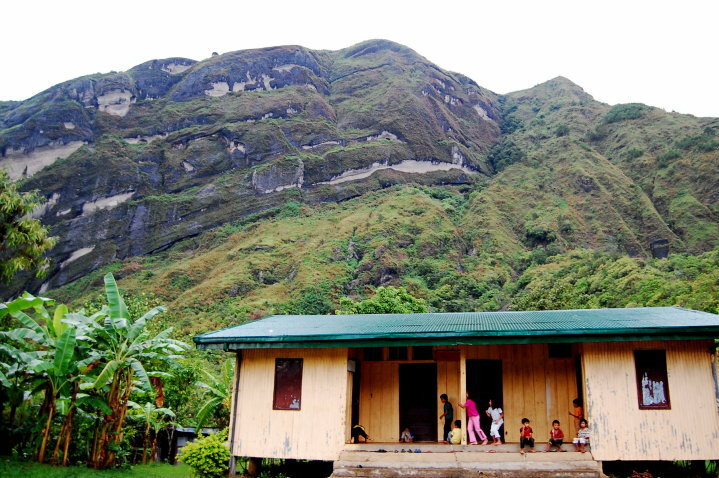 Sitio Polis Elementary School and Sitio Polis Day Care Center serve five communities - Polis, Pakda, Ginawang, Liwan and Dacdacan (the remotest community, which is two hours away by foot). Some students trek as much as two hours to get to school, sometimes using just makeshift bags, made of sacks. With that reality in mind, we were determined to give them the donations that we gathered from friends, relatives, and even from those who learned about the project only through social networking sites. We arrived at our jump off point a bit delayed in our schedule. We were worried that the usual 2:00 PM rain storms in Barangay Poblacion would make our trek much more difficult, not to mention the donations that might get damaged. But, our prayers for good weather were heard. The sun shined until about 5:00 PM. With the help of the parents of the school children, we started transporting our gifts to the children of Polis. It was almost dark when the last team arrived. After securing our sleeping sites and taking off our shoes, we began preparing for the next day's activities, not minding the body aches caused by the long walk. The next day, we were all up early, thanking God for again another beautiful weather. We used two classrooms as our sleeping quarters. It had wooden flooring so it was already comfortable for us. We had books, backpacks filled with school supplies, educational toys, storybooks, raincoats, boots, and loot bags. Some volunteers manned the kitchen. The locals appreciated it so much that the meals we cooked were all served to them. During the program, I gave a short welcome remark and after that, we proceeded with the games for the children and some of the parents. We distributed the gifts after the games. Members of the community returned the gesture by singing a beautiful thank you song for us. It was another beautiful TREK. After the outreach, we trekked back to the municipal hall, where we decided to spend the night. Some of our volunteers had difficulty on the trek back and we had to send a rescue team. But, thank God, before 8:00 PM, everyone was already at the municipal hall to rest. Well, most chose to spend the night celebrating. I joined them.